Cost pressure in the automotive industry is a constant. The OEM's are expecting interior products like door-uppers, armrests or even entire door panels and instrument panels to have excellent quality at a very economic price. Vacuum laminating is the key to this success utilizing high automation to insure the best product quality at the lowest price level. Kiefel’s answer to this high customer demand is the newly designed and developed "Tailored Blank Laminating" Technology and Machine. The innovated Kiefel TBL vacuum laminating machine operates completely automatic, without any operators. Operators are substituted by robots. The unique feature: Tailored blanked exact foil precuts will be used. Thus how the name of this new technology was derived. 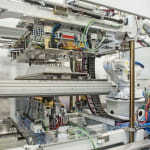 By utilizing a uniquely designed servo motor gripper system, the Tailored blank foil precut will be positioned and aligned on the substrate without any foil pre-stretch before the TBL-tool will be closed and the vacuum laminating process takes place. Cutting knives, integrated in the TBL-tool are responsible for exact foil overlap length for the subsequent edge-folding process. For this application Kiefel developed a completely new highly automated vacuum laminating machine. Robots which are integrated components of the machine are not responsible for movement of tool components and parts only. These robots will also be used to transfer the TBL-laminated parts to the subsequent process, e.g. edge-folding or punching. It means that the automation solution is integrated in the machine and more or less free of charge. 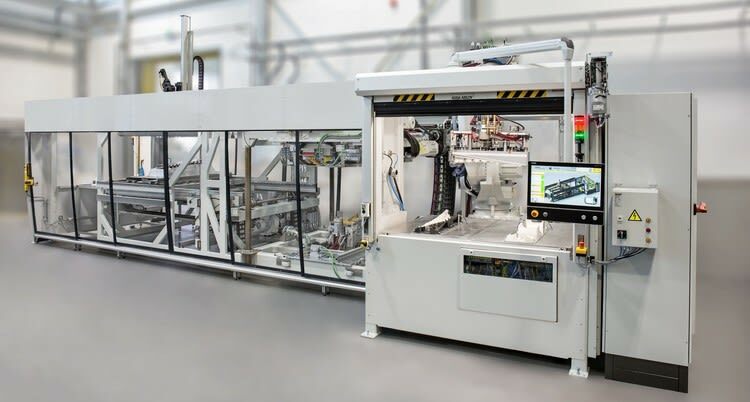 The TBL machines new innovative design reduces the overall machine footprint by 50% in comparison with traditional vacuum-laminating machines with the same output, which is another big advantage of this new TBL- machine. Based on using the tailored blanks foil exact-precuts the entire foil consumption can be reduced up to 40% in comparison to traditional vacuum-laminating technology. The TBL technology interior parts will be produced at a more cost effective rate offering savings over the production period of 5 years in the range of millions of Euro.